On Jan. 3, 2007, Cadeem Gibbs, 16, started out with 100 bags of crack cocaine in his pocket. He finished the day with seven bags of crack cocaine, $924, and a one-year sentence to Rikers Island. Charged with drug possession and intent to sell, Gibbs knew that there was no escaping his fate. “For the first time ever in my life, I remember being afraid,” Gibbs said. Initially, when Gibbs was arrested on 125th Street in Harlem, he told the police officers that he had no identification on him and that he was Sean Farmer, a 15-year-old made-up person from Harlem. “I lied because there was no way that I was telling them my real identity and my real age. Even if it didn’t work, I thought it would save me some time before going to jail,” Gibbs said. Shortly after, Gibbs’ mother found out about his arrest through one of Gibbs’ drug clients. she appeared at the 32nd Precinct in Harlem looking for her son but was told by a police officer that no one with the name “Cadeem Gibbs” was being held there. From afar, Gibbs’ mother saw him handcuffed to a pole under the alias “Sean Farmer.” His identity was revealed, thus his fate as a 16-year-old adult criminal was sealed. Shortly after central booking, Gibbs was forced onto a large white school bus with the words “Correction: New York City” plastered horizontally across the chipped white and blue paneling. When Gibbs stepped onto the bus, he noticed the first eight rows were cages outlining seats followed by eight rows of two person seats. Shackled to a man who reeked of alcohol and body odor, Gibbs endured a 20 minute bus ride to Rikers Island listening to this man ramble on about what was going to happen when they arrived at the jail. “Here we go again,” the man said. Within 48 hours of his arrest, Gibbs arrived at Rikers Island. Entering the island, Gibbs peered outside the tiny, dark window of the bus and saw this grandiose, dimly lit sign that read, “City of New York Correction Department Rikers Island: Home of New York’s Boldest.” Barely able to keep his eyes open after being awake for almost two days, Gibbs anxiously awaited as the bus arrived at the jail. “The real fear set in when I actually got in the facility,” Gibbs said. Given a green drinking cup, rubber toothbrush, plain toothpaste, a grey blanket, two pairs of rough sheets, a pair of bright orange shoes, Gibbs settled into his new home, 22 Cell Block, for the next nine months. “The whole atmosphere is like a permanent dark cloud,” Gibbs said. New York State is the only other state other than North Carolina that tries 16- and 17-year olds as adults, regardless of the severity of the crime. Approximately 50,000 16- and 17-year-olds were arrested and faced prosecution as adults in criminal court with the vast majority committing minor, nonviolent misdemeanors in 2013, according to the annual performance report by the New York State Division of Criminal Justice Services. In his 2014 State of the State address, Governor Andrew M. Cuomo proposed establishing the commission to “Raise the Age” and help ensure young people become productive and successful adults. “It is time to improve New York’s outdated juvenile justice laws and raise the age at which our children can be tried and charged as adults,” Cuomo said in his speech. In an effort to restructure the youth justice system, Cuomo assigned a panel to examine the state’s juvenile sentencing system and make the proper recommendations on raising the age of criminal responsibility from 16 to 18 years old. The commission will have until the end of the 2014 year to form its recommendations. “There is no right answer or magic bullet that will fix this enormous problem…This is a misguided statute. We can do much better. We can help these children and do so while upholding public safety. The two issues are not mutually separate,” Jeremy Kohomban, president and chief executive officer of The Children’s Village, a charitable institution dedicated to children and families of New York City, said. 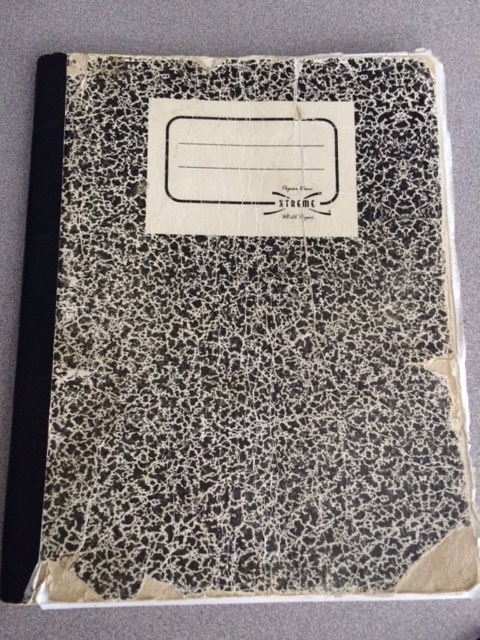 Cadeem Gibbs’ composition notebook from his first sentence inside Rikers Island. $2, 980 dollars weekly stock, and still have $1,285 dollars weekly left for necessities. Admitted to Bronx Community College in 2008, Gibbs declined the offer due to an arrest for selling drugs on Feb. 20, 2008. Gibbs went straight back to Rikers Island for six months. After being released in August, Gibbs said he felt like it was coming back to nothing – no business, no apartment, no girlfriend. Two weeks later, Gibbs was arrested for attempted murder and robbery in the first degree. “It was a drug transaction gone wrong. I gave someone a decent amount of money and they sold me something that was fake,” Gibbs said. “That was my lowest point because I had nothing and that led me to do what I did.” Spending two years at Rikers Island and then four years at Greene Correctional Facility in Coxsackie, New York, Gibbs was released on April 11, 2013. While at Greene Correctional Facility, Gibbs enrolled in the college-prison program and received 27 credits with a 3.5 grade point average. “Everything was a self-motivated thing. In prison, I am just a number. So I had to do it for myself. I knew it was the last step before I transitioned back home,” Gibbs said. For juvenile criminals like Gibbs, his first sentence to Rikers Island at 16 years old was not his first or last interaction with the justice system. At the ripe age of 11, Gibbs had been arrested for bringing a weapon to his sixth grade class. From there on, Gibbs got involved with drugs and gangs by the age of 14 and preceded to carry out the same patterns of criminal activity until the age of 24. Over the span of his life, Gibbs has spent eight years in both the juvenile and the adult prison systems. For young offenders like Gibbs, the rate of recidivism, the act of relapsing into criminal behavior, increases when treated and charged as adults by the court system at the age of 16. Youth admitted to the adult criminal justice system expose themselves to 34 percent more re-arrests for felony crimes than youth retained in the youth justice system and are 80 percent more likely to commit more serious crimes, according to a 2007 study published by the U.S. Centers for Disease Control’s Task Force on Community Preventive Services. In order to reduce the number of re-arrests and threats of recidivism, “The Task Force recommends against laws or policies facilitating the transfer of juveniles from the juvenile justice to the adult judicial system for the purpose of reducing violence,” Robert A. Hahn, Coordinating Scientist at the Centers for Disease Control and Prevention said. Youth in the adult system receive limited services and often become socialized into a culture where their role models are adult criminals and violence is a routine part of life, according to Charles Davis, Program Manager at Harlem Justice Community Program. “When you place a person in that situation/structure of the adult justice system, the outcome will be a poorly educated young adult,” Davis said. “You essentially handicap them from being a productive adult because you aren’t giving them the proper tools to succeed.” Young men like Gibbs have the capacity to move their lives away from a life of crime but it is up to the external systems to support that person and help them become whole again, Davis said. Since serving six years for attempted murder and robbery, Gibbs has struggled to find a consistent and stable job that he both enjoys and pays the bills. Determined to get right back on his feet after being released from prison in 2013, Gibbs has bounced from job-to-job as a campaign aide, paralegal, maintenance worker, peer counselor, motivational speaker, and warehouse worker. Due to Gibbs’ inconsistent work flow, from December 2013 to October 2014, he said he was practically jobless and homeless. “I was seriously depressed,” Gibbs said. On Oct. 2, 2014, Gibbs was arrested in Harlem for one count felony arrest charge and arraignment charge for third degree robbery. “After that, I kinda fell into a slump to be honest,” Gibbs said. Gibbs denied the charges and said it was a misconception from the person that reported the incident and the police that arrested him. He is due to appear in court on Jan. 13, 2015 for the hearing and trial. For Gibbs, his arrest, on what he claims are faulty charges, is an example of how he is mistreated because of his arrest record, thus making him a victim of the justice system. 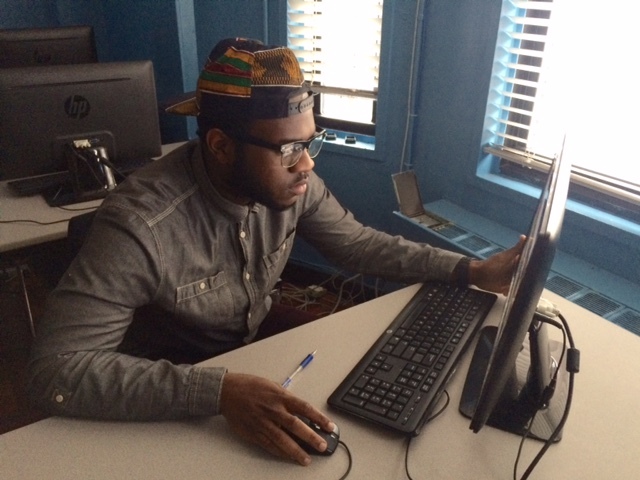 Cadeem Gibbs checks his emails at The Children’s Village in Harelm, New York. Sitting behind a desk, staring at a computer screen in The Children’s Village computer lab on a Wednesday afternoon in December, Gibbs looked at the page of emails sitting in his inbox. The reflection from Gibbs’ Gmail account illuminated from his plastic framed glasses showcasing a series of bold letters drowning the page. The baby blue walls of the computer lab contrasted with a large whiteboard reflecting light from the two small windows adjacent to where Gibbs sat. Inspirational quotes from famous political leaders and artists scattered from every corner of the whiteboard. “During your life, never stop dreaming,” from Tupac. “It always seems impossible until it’s done,” from Nelson Mandela. These words fell into the darkness as Gibbs carefully focused on and read an email from the law office where he recently got employed a month ago as a paralegal aide. Gibbs leans back in his seat and says he has too much on his plate and needs to eliminate some projects and jobs from his life. With the help of Artspace, a Minnesota-based non-profit real estate developer dedicated to “artist-led community transformation,” in collaboration with El Barrio Operation Fightback, a local non-profit organization dedicated to the housing, economic, and social service needs of East Harlem, PS 109 transformed from an abandoned Gothic revival schoolhouse to an affordable housing unit for artists and their families in the matter of two years. El Barrio’s Artspace PS 109’s mission is to serve the East Harlem community by creating permanently affordable housing for people and families committed to the arts in a neighborhood constantly threatened by gentrified real-estate developers. The project aims to preserve the essence of El Barrio by reserving at least 50% of the units for current residents of East Harlem. 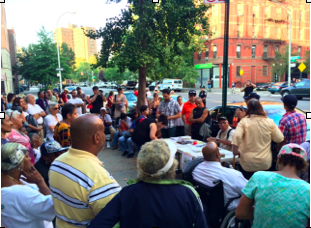 “East Harlem is not like other communities. We are going through our own transition and PS 109 highlights the needs of the community. This is another piece of the puzzle. Another piece for making East Harlem a destination location for the Latino community. 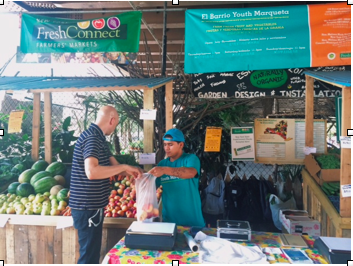 An opportunity to experience the flavor of El Barrio,” says El Barrio Operation Fightback Executive Director Gustavo Rosado. The $52 million dollar conversion project broke ground two years ago on October 2, 2012 with the help of funding from Low-Income Housing Tax Credits, State and Federal Historic Tax Credits, and other city, state and federal sources. According to Artspace Asset Manager Jennifer Marmol, over 15 New York City organizations and agencies help fund this project, including NYC HPD, NYC DCA, and NYC Council. Currently, Artspace and El Barrio Operation Fightback are in the process of reviewing 52, 352 applications for the 90 unit apartment building, with the hopes of moving in residence by the end of November. Dedicated to serving the needs of the community, El Barrio’s Artspace PS 109 offers apartment units affordable to low and middle income community members based off of East Harlem’s total median income of $30,000, according to the U.S. Census Bureau. Rents will range from around $500 to $1,000 a mont depending on unit and family size and total income. From studio apartments to two bedrooms, each unit intends to be a “live/work” environment equipped with high ceilings, large windows, durable surfaces and wide doorways to accommodate and foster the creative process of its residents. Since the project broke ground two years ago, Artspace and El Barrio Operation Fightback have received support from Community Board 11 and political advocates within the community. However, many local residents remain skeptical over the development of another affordable housing option. For East Harlem native Brendan Marmolejos, applying to another affordable housing development wasn’t even an option because he knew he’d ultimately get rejected like the rest of the people. “I am skeptical because with all of these affordable housing developments, there are always pitfalls and stupid reasons why you don’t get in, like if you don’t have gray hair or aren’t seriously living on the streets. I feel like Artspace is a small step in the right direction but right now with gentrification happening, all of the original culture and people are being pushed out of El Barrio,” says Marmolejos. 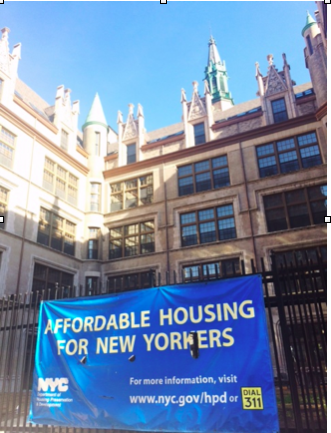 Only 0.2% of the applicants will receive housing in El Barrio’s Artspace PS 109. For many East Harlem residents, they will receive denial letters within the next few weeks from Artspace and will have to prepare for the next application process. Those rejected from PS 109 will have the opportunity to be put on the apartment building’s wait list, in the hopes of receiving an opportunity in the future to live in the artist community. Rosado says his organization is dedicated to the people of the community and they will continue to fight for affordable housing. The Yomo Toro Apartments offer 88 newly constructed units on 222 East 104th Street in East Harlem. El Barrio Operation Fightback and Rosado are currently working with individuals and families who meet the income and household size requirement to apply to this new housing unit. Ultimately, Rosado believes that the efforts of affordable housing developments such as Artspace and Yomo Toro cannot compete against the private developers in the community. “We are advanced as non-profit organizations and developers but we are not going to be able to stop private developers. The major difference is that we are not for profit and they are gaining something from their developments because they have the money,” explains Rosado. El Barrio’s Artspace PS 109 remains vacant until the end of November of this year. Rumbling echoes of the subway surround the air, as customers from East Harlem and the surrounding neighborhoods swarm to four, wood-paneled fruit and vegetable stands underneath the Park Avenue elevated trains. It is a warm, Thursday afternoon in August and the outside breeze disperses an aromatic, tangy scent from the layers of oranges and baskets of berries smushed together on one of the fruit stands. A young, Hispanic male sporting a backward baseball cap and a blue tee-shirt sits behind a small fold-up table with a locked cash box, a medium-sized scale, and a bundle of plastic bags scattered around the brightly colored, plastic floral tablecloth. He watches the customers as they peruse the produce and he offers to help a man put fresh, Gala apples into a plastic bag. For 21-year-old Brooklyn native Adrian Rosado, El Barrio Youth Marqueta of East Harlem provides an opportunity every Thursday, Saturday, and Sunday for him to drastically change and improve his life by building management skills, customer service skills, and life skills. 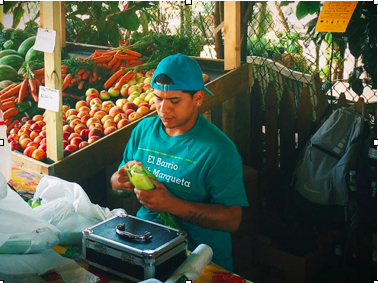 Adrian Rosado prepares vegetables for a local customer on Thursday, August 28, 2014. Rosado says his connection to “Litefeet” street dance crews and local gang members on the streets of Brooklyn, Manhattan, and Queens during his adolescence and early adulthood led him to three different prison sentences at Rikers Island and Metropolitan Detention Center, Brooklyn. In the last year, Rosado joined Union Settlement in East Harlem, an on-the ground resource and advocate center for the needs of those in underserved communities. Through the Youth Services program, Rosado earned his GED and landed a job at El Barrio Youth Marqueta for the grand opening in July 2014. Under the supervision of director of 25-year-old Santos Rivera, five young adult males from East Harlem, Brooklyn, and the Bronx work and run El Barrio Youth Marqueta every Thursday, Saturday, and Sunday. “We work with the youth so that way if they are at risk, they have a brighter future, a brighter aspect and outlook on the future; instead of feeling that they are trapped in the neighborhood so they can feel like they are gaining valuable skills,” says Rivera. Adrian Rosado helps local customer Thomas Hirschelmann choose ripe peaches on Thursday, August 28, 2014. An increasing number of migrant youth from Central America enter the United States each year in search of their parents, relatives, and a safer living environment. Fleeing from countries such as Guatemala, Honduras, and El Salvador, many of these migrant children temporarily or permanently reside in New York State, where they receive federally funded legal aid and special service care. Federally-funded state agencies in New York provide migrant youths with special-care services including health, education, and legal aid. However, these organizations struggle to receive proper funding from the government to give each migrant child sufficient educational, legal, and health services. Approximately 70,000 migrant youths will enter the U.S. during the 2014 fiscal year and 90,000 will face detainment and deportation, according to a February report conducted by Kids in Need of Defense (KIND) and the UC Hastings Center for Gender and Refugee Studies. In many cases, these migrant youths facing detainment and deportation will have to endure court proceedings lasting up to four years, with the ultimate fear of returning to their home countries or living as an undocumented immigrant in the U.S..
With the recent influx of migrant children to New York State from Central America, some organizations have to turn away children and send them to outside, private organizations, due to a lack of funds and personnel. Special care organizations, such as Catholic Charities of the Diocese of New York and The Children’s Village of New York City, who provide refugee for undocumented migrant youth and advocate for their protection within the legal system, believe the issue extends beyond the legal cases of these children. “We need to look at the gaps and here is where New York State comes into play. Nobody yet has placed sufficient emphasis on the non-legal services on kids and their family’s needs. They have potential to become our future and nobody has placed emphasis on investing their future,” says Monsignor Kevin Sullivan, Executive Director of Catholic Charities of the Diocese of New York. 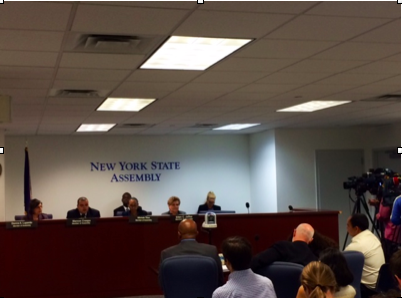 Monsignor Kevin Sullivan and Jeremy Kohomban testify before the New York State Assembly at a migrant youth hearing on September 16, 2014. In order to assure protection and humanitarian aid to migrant youth, Sullivan says the New York State Assembly must allocate the proper funds and services on their agenda. “By investing about $24 million dollars a year in these kids, we can assure their future and the future of New York State…This is a situation which cries out to us” says Sullivan. Currently, The Children’s Village houses 57 migrant children in their 200 bed shelter. President & CEO Jeremy Kohomban explains that his organization provides shelter and services to children from over 41 countries, before they are released to their custodial families or put in federally funded, special foster care. “This journey is not an easy journey and it is not a journey that you would want for your children. These children come here [illegally] and are put in the care of scrupulous people, gangsters oftentimes. So it is our job to help these children and provide them with a team of experts who review homes and families so that these children can live in a safe, family setting,” says Kohomban. On Tuesday, September 16, the New York State Assembly Committee on Social Services and Standing Committee on Children and Families Task Force on New Americans held a public hearing with State agencies to address the influx of migrant youth from Central American countries and to examine the state’s role in caring for youth who enter the United States illegally through the southwestern border. “Here in New York City, we are fully committed to supporting these children and their families,” said Nisha Argarwal, Commissioner to the Mayor’s Officer of Immigrant Affairs in New York City. Unfortunately, all of the invited city, state, and federal agencies declines to attend the hearing, according to Assembly Member Marcus Crespo. Federally-funded State agencies in New York try to provide these migrant youth with legal aid and special care services. However, these organizations struggle annually to receive proper funding from the government to give each migrant child sufficient educational, legal, and health services. “By investing about $24 million dollars a year in these kids, we can assure their future and the future of New York State. They have potential to become our future and nobody has placed emphasis on investing their future,” said Monsignor Kevin Sullivan, Executive Director at Catholic Charities of the Diocese of New York, at Tuesday’s hearing. The special service care providers and legal aid organizations present at the hearing agreed on the common notion that this issue starts with the whole young person and encouraged the assembly members to examine the funds allocated by the state in regards to helping these children. 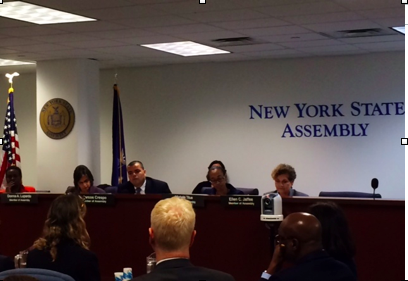 The New York State Assembly holds a hearing to discuss the recent influx of migrant youth from Central America to New York City, on Tuesday, September 16, 2014. On January 31, 2014, 55-year-old Thomas Edwards was released from Sing Sing Correctional Facility in New York, after serving a 21 year sentence for bank robbery. From the age of 12 to 55, Edwards led a life of crime. Looking back, Edward says, “three people died, I was arrested twice, for a total of 26 years, and I robbed over 20 banks.” Not to mention, at one point, Edwards was wanted and “on the run” in four states for withholding thousands of dollars worth of cocaine and hundreds of guns in his possession. While in the “box,” otherwise known as solitary confinement, during his second sentence in prison, Edwards says his major turnaround was when he decided to not do crime anymore. It was during the 46 day stay in solitary confinement that Edwards changed is life for the better. Through the grace of the Exodus Transitional Community in East Harlem and the Executive Director Julio Medina, Edwards is now seven months free of his criminal past and has started a new life as a mentor to young, criminal adults through the Exodus Common-Unity program. 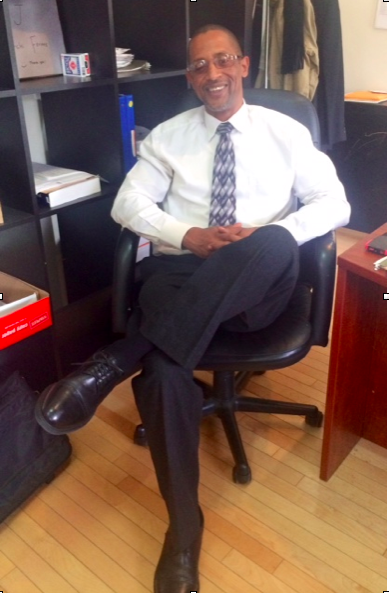 Thomas Edwards sits at his desk at the Exodus Transitional Community on Wednesday, September 10, 2014. Q: Where did you grow up? And how did your childhood shape the rest of your life? Q: Where did you go and what happened after your were released from the juvenile detention center? Q: Why, at such a young age, were you drawn to the streets? What did the streets provide that you did not receive inside your household or at school? Q: You mentioned your stepfather earlier, was he one of the reasons you turned towards the streets to look for compassion? Q: Until what age were you living in the streets? Q: When did you get caught for the second bank robbery and can you explain the incidents from that day? Q: How is it possible that you only faced 21 years for the robbery, when you were wanted in numerous states and the robbery case was connected to a murder that day? On Thursday evening, August 28th, approximately 80 East Harlem community members and activists gathered on the sidewalk of E. 118th Street and Pleasant Avenue to protest the recent plans of Blumenfeld Development Group and Forest City Ratner Companies to develop luxury towers atop the East River Plaza Mall. East Harlem locals gather on 118th Street and Pleasant Avenue to protest the recent development plans to build luxury towers atop East River Plaza. The assembly of locals and activists raised concerns that the development will drive out most of “El Barrio” friends and neighbors, displacing poor people and exclusively attracting the upper-middle class to the Pleasant Avenue neighborhood. The demonstrators, who led the protest with the slogan, “El Barrio Unite,” believe the luxury towers will interrupt the community’s class-structure, economic development, quality of life, and preservation of East Harlem. Blumenfeld Development Group and Forest City Ratner Companies first announced their proposal to build the 1,000 unit residential towers atop the East River Plaza mall in East Harlem to local community members at a East Harlem community meeting on Wednesday, July 9. At this initial meeting, the developers proposed a 75-25 percent split of market rate and affordable apartments for East Harlem residents who earn 30-60% of the area median income, more than the standard 80-20 housing market ratio. In a joint statement released by BDG and Forest City Ratner on Thursday evening, the developers stated that a significant number of affordable housing units in East Harlem will expire in the next fives years and this proposal, “which includes 275 affordable units,” will create more affordable housing options in the community. There is “an acute need for more diverse housing options to fill that looming void. We are addressing this need by making a huge investment in East Harlem that will use the retail center to create new housing where it otherwise would not exist,” according to the developers’ statement. There were no BDG or Forest City Ratner representatives in attendance at the Thursday evening “El Barrio Unite” protest. 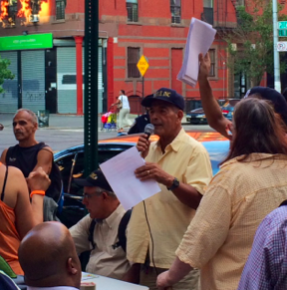 Robert Anazagasti calls on the community of East Harlem to fight back against developers.